The Bandit and the author. Note the Livingstone's eland seems to have lost its stripes and chevron. The stripes down the flanks are the key visual difference between a Livingstone's eland and a Cape eland. The head and neck of the massive Bandit showing the matted ruff stretching from the horns to half way down the nose and the huge neck measuring nearly 60 inches at the 'collar'. The author sitting level with the Bandit's shoulder to give an idea of their relative sizes. On closer examination, faint white stripes can be seen down the flanks of the eland confirming, if this was ever necessary, that this is a pure bred, wild Livingstone's eland. We spent the last day of my safari taking photographs. 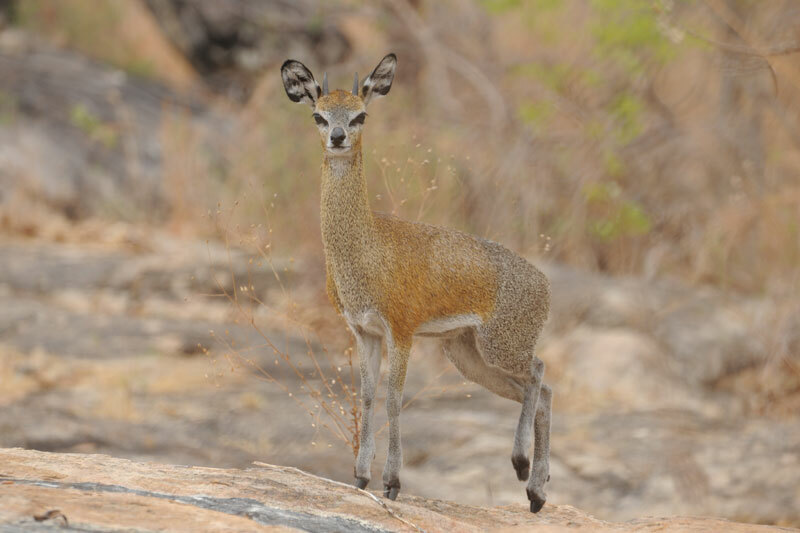 Using his home made predator call my guide, Ryan Cliffe, lured this young klipspringer - stamping his feet - to within 14 paces of where he lay behind a small rock and taking his photo. 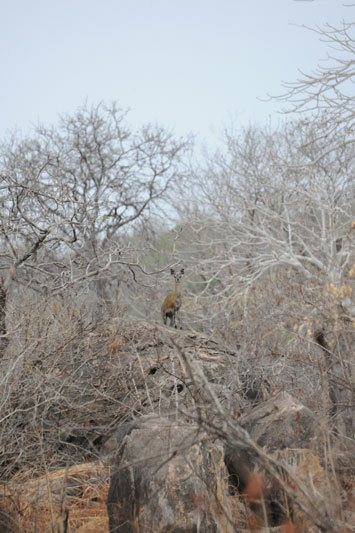 A young klipspringer male watches us walk past feeling secure on his rocky perch. 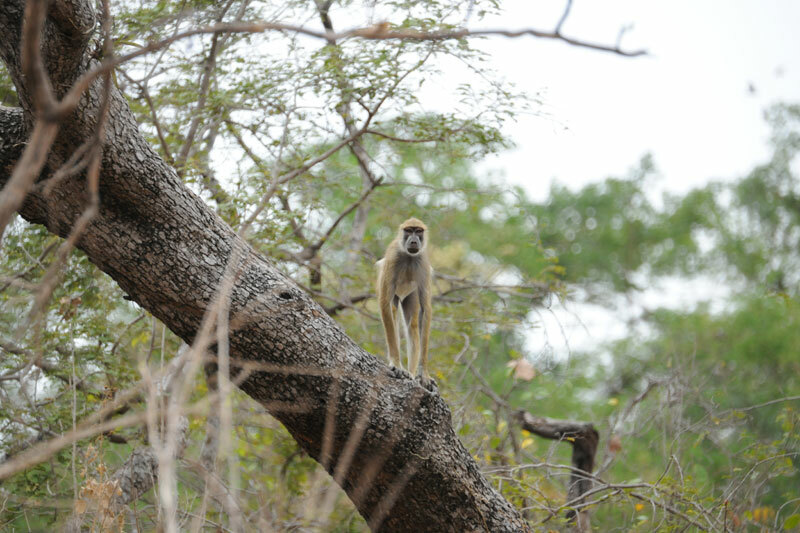 A scrawny yellow baboon watches as walk past. We walked within 30 metres of this old East African bush duiker at the third seep before he noticed us and, almost sheepishly, tip toed away. The fast drying Lugenda River as seen from my chalet at Lugenda Camp in the Kambako Safaris' concession in Niassa Rserve. 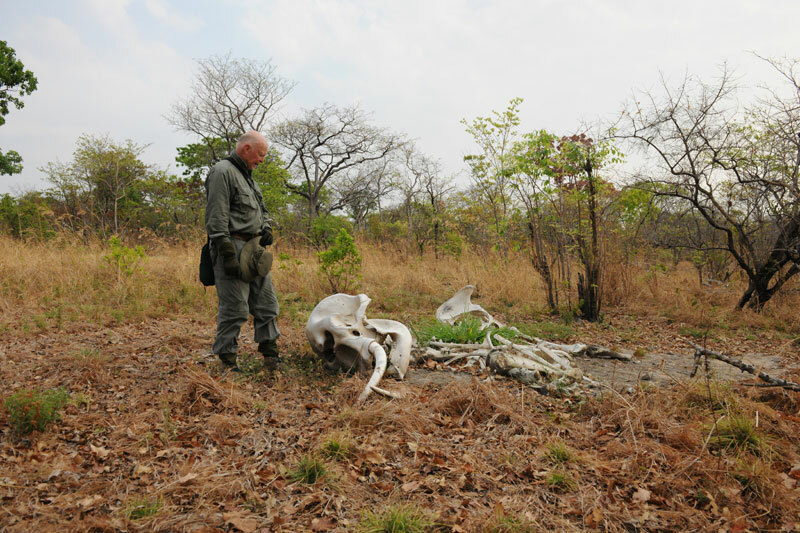 The author gazes down at the carcass of a juvenile female elephant wounded by poachers and left to die. As can be seen, the small, 11 pound tusks remain in the skull. Also note how all the usual vegetation has died around the carcass making it easy to spot from the air. This was one of eight carcasses seen during the hunt and, according to the author's guide, one of thousands in the Niassa Reserve apparently killed to feed the insatiable Chinese ivory carving market. 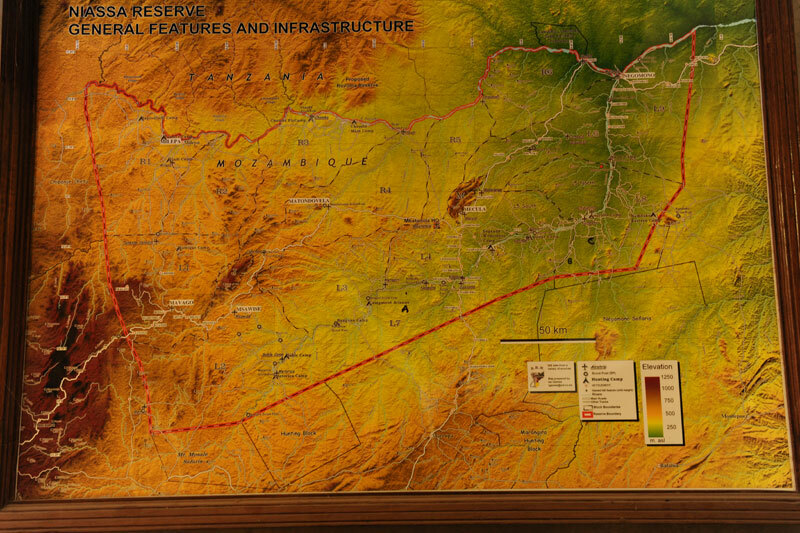 A map of the 4,2 million hectare Niassa Reserve showing Blocks A and B being the primary concessions used by Kambako Safaris in the bottom left corner and also showing the site of their Lugenda Camp used by the author. 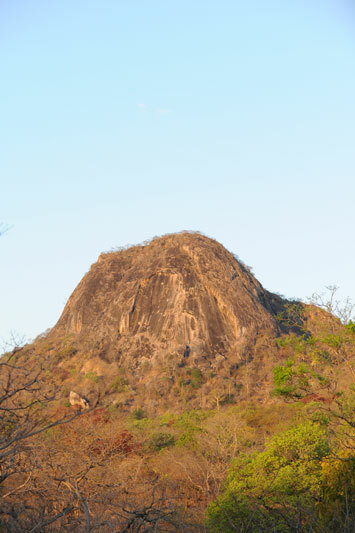 A lone granite inselberg or island mountain rises from the brachystegia or miombo woodland. 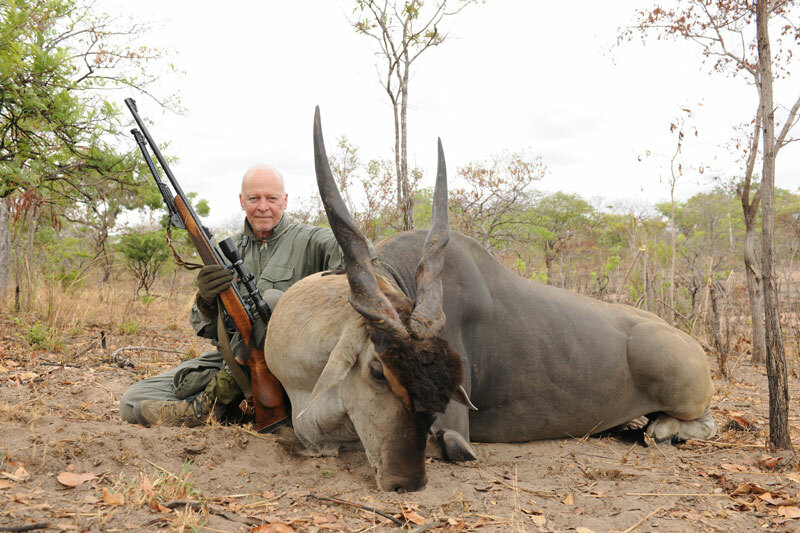 A good friend of mine, Peter Kennedy, the king of plus 60 inch kudu hunters, advises that whenever you seek permission to hunt kudu from a landowner, you should always ask to hunt two. That way, he says, you can always make up for shooting a smaller one earlier in the hunt. I prefer to think of it as insurance. It eliminates the risk of passing up a good, representative bull (which you enjoyed hunting and could have killed cleanly with one shot) because it was not be exactly what you hoped for. Then you ended up playing Russian roulette in the hopes of finding a bigger bull as the safari days wound down. I refuse to do that any longer as I grew to hate the increasingly desperate feeling as the last days of the safari hurtled towards you like a speeding tracer bullet and you started hunting differently. You dashed hither and thither trying everything to find a bull and, on the last day, had to settle for one you did not really want or go home empty handed. Well, there was no risk of me making this kind of mistake on my last safari. 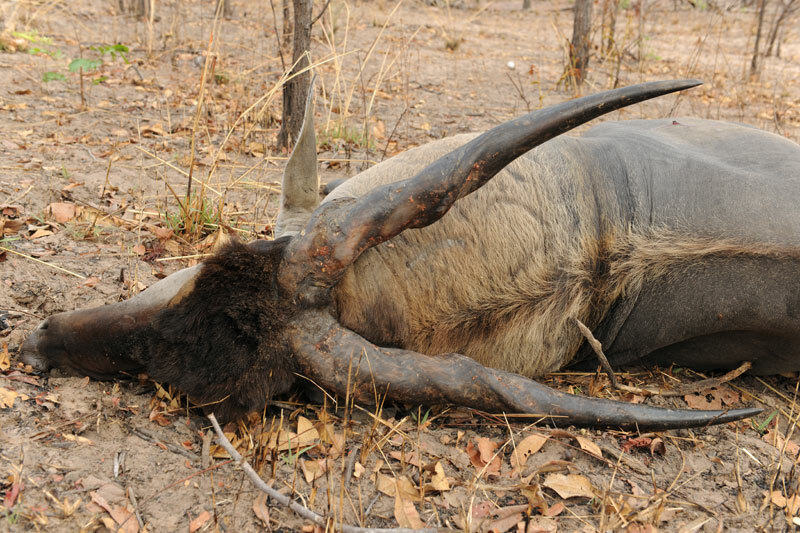 The first Livingstone’s eland bull I shot in Northern Mocambique’s 4,2 million hectare Niassa Reserve had been the bull of my dreams – an ancient, massive, blue black warlord with matted, black ruff reaching from between his horns to midway down his nose and almost obscuring his eyes; heavily scarred face, neck, dewlap and shoulders testament to many a battle; huge, swollen neck measuring nearly 60 inches in circumference; thick, gnarled batons like Popeye’s forearms on his head, worn almost translucent to the bone core; and front hooves a buffalo would have been proud of. I honestly doubt I will ever be lucky enough to see, let alone hunt and shoot, another bull like him. No, it was simply that I had six days left of my safari and, while I had other animals on my license, the outfitter, Kambako Safaris, still had eland left on quota and this happy coincidence seemed to be a sign that they should not be neglected. In addition, during my first eland hunt I had to choose between following the spoor of a huge, lone eland bull, the biggest I had ever seen, or the more certain tracks of a 30 strong herd containing a monster, old warrior, a photo of which my guide had managed to take when he bumped into them on his way to fetch the truck after a long, abortive stalk. I settled for the bird in the hand and was not sorry I did but, all week, the huge, lone, bull track was never far from my thoughts. It was clear from the deep indentations the tracks made in the soft, grey, sandy soil of the woodlands that this was a bull of note and I could not stop wondering what he would look like in the flesh. For years I had wanted to successfully hunt a lone "bandit" as they are called in CAR, seduced by their saucer sized tracks. I had tried six times in the vast, unfenced regions Africa still has to offer but had failed miserably on each occasion. It was as if the bandits knew they were vulnerable on their own. They walked faster, ate on the move and did not tarry at any of the water holes they irregularly frequented. They were also more alert and, from their spoor, you could often see where, after crossing an open area, they halted inside the first fringe of thicket or forest and watched their back tracks to see whether anyone was following. I wanted to try yet again for the elusive prize of a lone bandit even though I knew only too well that they epitomized the hoary old hunter’s maxim – they did not grown so big and old by being stupid! So, after a day of R&R to recover from the rigours of the previous day’s long track, stalk and recovery of the magnificent, old warrior, the wake-up call came far too early at 03h30 and, within an hour, we were back in my guide’s well kitted out, 18 year old, venerable but still reliable Land Cruiser, with Jeevers Ncube and Saide Faustino, our two trackers, on the back, heading for a remote piece of Africa which we had stumbled upon by accident while following the original, lone bull track. It was some three and a half kilometres from the nearest two tyre, dirt track, in the middle of rolling brachystegia or miombo woodland and home to at least five separate seeps or springs, one of them almost 500 metres long. In roughly the middle, a lone, tree and quartz covered hill, the lower slopes of which were choked with dense stands of baboon tails, watched over the rolling countryside, intersected by randomly emerging granite inselbergs – or island mountains to give the phrase its literal translation. We arrived back at the first seep just before 05h30 and immediately noticed the fresh tracks of a small herd coming in to drink. We coasted silently through the tall, dark brown, branchless, straight tree trunks on high alert with Jeevers nose down and on the spoor. But the seep’s slash of shockingly bright green vegetation cutting through the dull tans, browns and greys of the leaf litter in the all but leafless woodland – only a few shrubs were just beginning to sprout a first flush of soft, tender, pale green leaves – was empty. The herd had drunk and left and, despite searching the length of the seep, we could not find the bandit’s exit spoor. He was gone. Ryan Cliffe, my slightly built, expert, 35 year old, Zimbabwe qualified guide, suggested we climb the solitary hill and, on reaching the top, immediately spotted the green gash of a second seep in the far distance, the washing powder white bones of yet another poached elephant carcass between us and the seep and, much more importantly, a huge, blue black, lone Livingstone’s bull asleep under a tree at the foot of the hill. Could it be this easy, I wondered? Could I realize my dream on the first morning of the first day? If so, it would be a first for me as I usually ended up having to work hard for any game I shot. The excitement was palpable as the four of us, each stepping in the other’s footprints to minimize noise, silently snuck through the thin, straight, tree trunks and even thinner, black sticks protruding vertically from the ground after the last burn. I found myself breathing in short, shallow breaths and forced myself to inhale properly. We were totally focussed on the bull’s position to the exclusion of our surroundings and that was probably our undoing because, when we arrived at the spot, the bull was gone! Like a lighthouse – now you see it, now you don’t! He had been right there, resting in the shady copse of trees between the two elephant paths carefully noted before climbing down from the koppie. We looked around gob-smacked. Where had he gone? Surely, he had to be here? As we sniffed around trying to unravel the mystery, the story on the ground eventually explained everything. A herd of eland cows and calves, which had come in to drink from behind the hill, seemed to have spotted us on our stalk and, deciding that discretion was the better part of valour, had run off taking the bull with them and obliterating his tracks. Three kilometres and two undulations – not really hills – later, we came to the third and fourth seeps. We were now deep into terra incognita and found the miombo woodland alive with greater kudu, zebra, Roosevelt’s sable, impala, yellow baboons and at least three eland cows. We were stuck however. Any further advance would give the game away. We had to hunker down, wait for them to finish drinking and move away before we could go forward. The plus 40° C midday heat baked down as we sat out in the open behind a fallen forest giant on the hot-to-touch, grey sand. I started day dreaming and my mind meandered back to CAR one late afternoon as, covered in soot, clothes black striped from burnt twigs, wet shirt clinging to my back, dirty, mouth dry – the water was finished – we also sat, dog tired, at the end of a long, long day on the lone Lord Derby’s tracks as it headed arrow straight into the brush and reluctantly concluded the bull was emigrating. We had pushed him just once too often and he was not having any more of us. There was nothing for it but to call it a week. I could not help wondering if we were in for an action replay. As silence descended over the fourth seep, we eased forward. The tracks of the eland herd were easy to follow in the soft, loamy soil. Then, suddenly, the spoor showed that the herd had started running. Why? The wind was in our favour. They were too far ahead to have seen us. Maybe it was the sixth sense of the guardian cows but now it became an exercise of diminishing returns. They would be watching their back tracks and every time they were pushed it would reduce our chances of catching them until they too decided to emigrate and they had 4,2 million hectares to choose from in the Niassa Reserve. Tired after nearly seven hours on the tracks, we turned and trudged back to the truck nearly four kilometres away in a straight line according to Ryan’s GPS. But hunters are a resilient and optimistic lot. The "knock, knock" call at 03h30 the next morning was almost welcome. As I changed into my familiar long sleeved, olive green, cotton shirt and long pants – warmer than shorts and shirt sleeves I know but better protection against the swarms of tsetse flies and their red hot needles – I was eagerly looking forward to round two. It was an overcast day. Much cooler than the 43° C at midday yesterday. 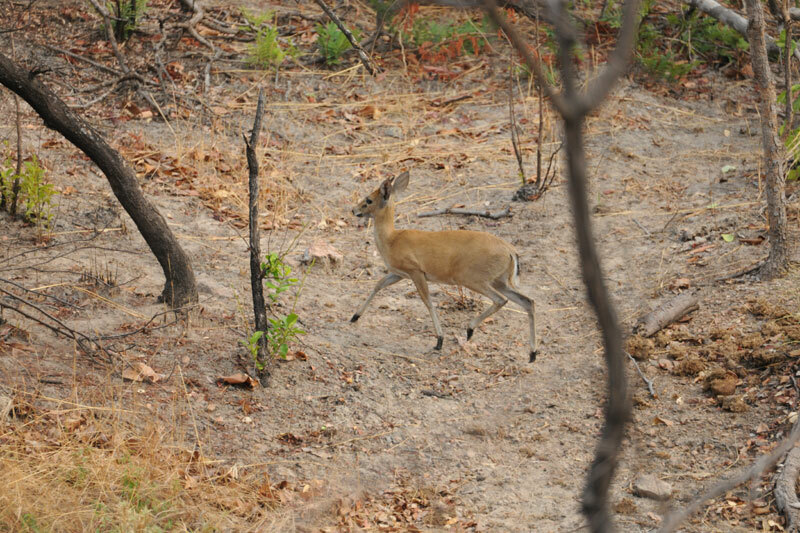 We walked almost briskly towards seep four but still came within 30 metres of an old duiker ram drinking at seep three before he spotted us. Ryan named the seep, "Peter’s Spring" on his GPS. Clever marketing I thought! Five hours after leaving the truck, we sat at the edge of seep four dappled with the deep gouges of recent buffalo tracks. Ryan took the time to set up two trail cameras to record proceedings at the seep in the hope it would tell us which animals drank when. I was ambivalent about this and, if I am faced with a similar situation in the future, will not make use of these cameras. Somehow it seemed wrong and I felt a bit like a Peeping Tom. We sat side by side, eating our cheese and tomato rolls and drinking water. "What do we do now? " Ryan asked. "Apart from the tracks of the new eland herd that came to drink at seep one, we have found nothing new. Do we press on or go back? " I was worried. Had we given the game away yesterday? Was this is a bit like hunting from a machan where, over a three day period, the build-up of scent and sound as a result of prolonged and regular use soon emptied the glade over which the machan watched. After this, the glade needed to be rested for a week or so in order for the regular inhabitants to feel safe enough to return. The problem was I didn’t have a week to spend – only three days of my safari were left. "Let’s carry on for a bit," I suggested. "Maybe there is more water further in. " I was stiff getting to my feet after the rest. A reminder, if I needed one, that my knees might not have all that many more kilometres left in them. I hobbled forward but slowly normal movement returned as we settled into our regular routine – Jeevers in front carrying my customized Brno .375, loaded alternately with 300 grain, Swift A Frames softs and solids by Norma, then Ryan with his .450 Ackerly on his shoulder and a heavy belt carrying his GPS, radio, camera, knives, Leatherman and ammunition, then me and, finally, Saide, with our water – without which none of this was possible – and the shooting sticks. 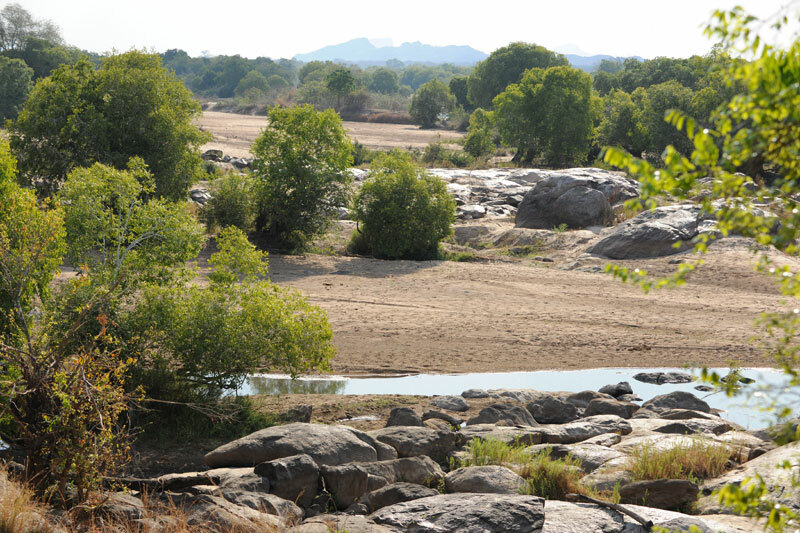 In Kambako’s vast 424,000 hectare, unfenced concession in Niassa Reserve, in October, no water, no hunt. We are easing diagonally up the rise away from the seep when I hear a strangled gasp from Saide behind me. As I turn and look, his long, left arm snakes out, he points and one word escapes his lips – "Eland!" As one we sink to the ground and I yank my 10×40 Leica Geovids from beneath my left armpit. I see nothing. As I look back at Saide with a questioning look, I hear Ryan murmur, "The bull is coming straight towards us. " 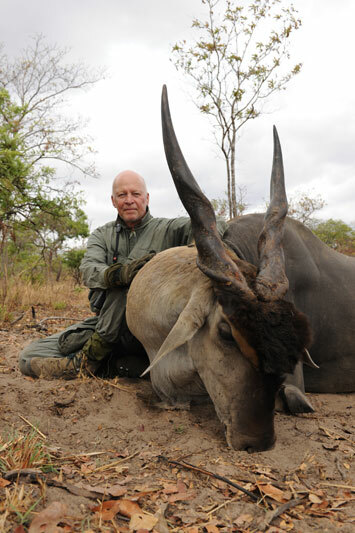 It is an action replay of a Lord Derby’s eland hunt in Cameroon six years ago. I move in behind Ryan, pass him his home made shooting sticks which Saide has been carrying and, together, in one smooth movement, we stand up. He steadies the sticks and I slide my old rifle over the twin "Vs" at the top. It is not a moment too soon as I pick up the bull some one hundred metres away plodding head down on the diagonal straight towards us. He has made a bad mistake which, I guess, is the only way you will ever outwit one of these bandits. He has checked out the seep from the tree line, decided it was safe to approach and has not checked again. Our inadvertent timing has been perfect. We have been unbelievably lucky. At about 80 metres the rifle fires itself as the crosshairs settled on the point of the bull’s right shoulder. The massive, old warlord bucks at the shot, hairs off but, after a mere 50 metres, runs out of steam and it is clear his final race is run and the rest of the proceedings are a formality. At long last I have found a bandit or, should I say, a bandit has found me. I have been incredibly fortunate but comfort myself with thoughts of the number of times luck worked against me – the wind that swirled, the tracker who cracked an underfoot branch, the scrub that covered the bull’s shoulder the one time he halted for a few seconds within shot – I can go on and on. Either way I am a very happy hunter. Wasn’t it Napoleon who said he would rather have lucky generals than good ones? At first glance he is a wonderful, mature, blue black, wide-necked, beast of a bull with thick, well-worn horns, which later measure 36 inches in the skinning shed, comfortably beating the Rowland Ward minimum of 35 inches. On closer examination, he is clearly much older than I first thought. His horns, while much longer than the first bull, are also worn down to the bone core in places and I estimate he is only a year or so younger. I so enjoyed my safari with Kambako Safaris, Ryan Cliffe and his team in this pristine part of Northern Mozambique. The acid test, however, is to ask yourself whether you would want to return and do it again. OK, I’ve thought about it. Hell, yes, is the unequivocal answer. In a heartbeat! In my humble opinion, this is the best area for big, old Livingstone’s eland bulls I have come across or heard about. The downside is that you need to hunt in October when the big, old bandits emerge from their thicket strongholds and start to sniff around the coalescing cow herds. Secondly, it is brutally hot and, thirdly, the area is vast and you need to be reasonably fit as you will, in all likelihood, have to walk about 10 kilometres a day and sometimes much further. Lastly, there are tsetse flies and sweat bees to contend with. They are everywhere. On the other hand, the quality of the camps, food, staff, vehicles and professional hunters more than compensate for these inconveniences and the prize is a lifetime memento of one of the most iconic animals of the African bush. 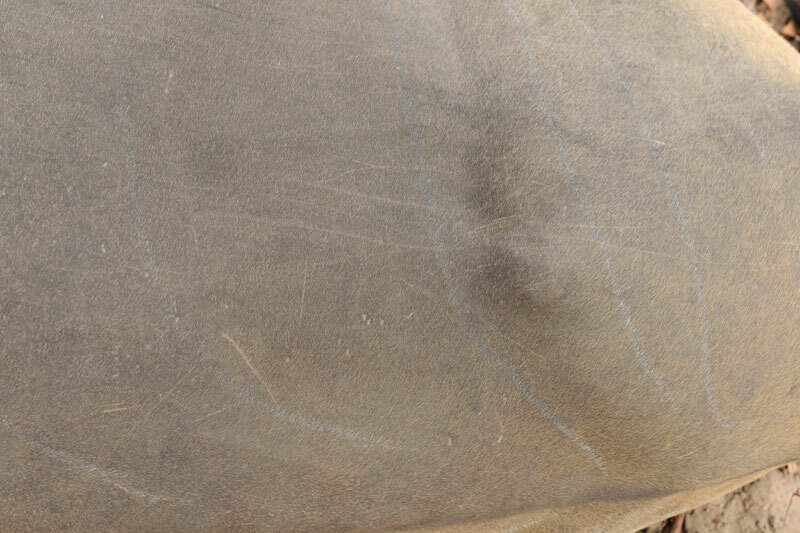 As you can see from the photographs, an old, Livingstone’s eland bull often loses his characteristic white, flank stripes and nose chevron and the colour of his coat may not be as attractive as his giant eland cousin. But he is every bit as big, if not bigger, then the Lord Derby. Although his legs are shorter – both bulls measured 71 inches from the bottom of the front hoof to the middle of the back versus 75 inches for the last Lord Derby’s I shot – his hooves are bigger, an indication that the weight of a big Livingstone’s eland bull equals or exceeds that of a Lord Derby’s eland. While the latter will always be my favourite animal to hunt, especially in the overgrown golf courses that pass for the bush in eastern CAR, hunting their old, experienced cousins in Northern Mozambique is not only very similar but comes a very, very close second.